Do you want an arrangement/composition for your band, choir, etc, is it possible to contact Ken-Gøran Mikkelsen to hear about the possibilities. 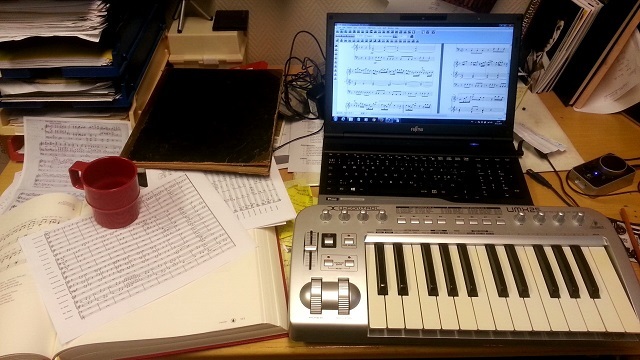 He has arranged several music for choirs (mixed, male, female and children), brassband and ensembles, and is a very popular composer and music arranger in the Lofoten islands. - "Sapmi Fantasia" he wrote in the autuum 2018, with financial support from Sametinget / Samediggi. This music piece is in 7 movements, written for different instruments, but mainly for church organ. First movement is for organ, second movement is for trumpet and organ, third movement is for organ, fourth movement is for mixed choir (SATB), fifth movement is for trumpet and (grand) piano, the sixth movement is for organ, and the last movement (seventh) is for bass (voice), percussion, flugel horn and organ. everything is based and inspired by the folk music from Sapmi..
- "Hymns from Sápmi" was written for brass band in 2016. The piece is playing with different folk tones from the Lapland. It was premiered in Bodø march 2016, at the Gala concert for the championship Vinterblås. - His first full brass band composition, he wrote in 2001, named "Englehær / Army of angels". - Arranged and wrote a full concert, included the full text for the presenter (who was him self), with the heading "Romantic evening", for mixed choir and piano. Read the article from the news paper (in Norwegian) here. - Wrote 10 songs for choir (mixed, female and male) for a special project called "Norwegian evening", 2014. Read the review from the news paper here (in Norwegian). - The church in Valberg (Lofoten Islands) celebrated 125 year anniversary, so he wrote the composition "O sjæl" for trumpet and euphonium (2014). Read more (in Norwegian) here. - The famouse Norwegian singers Steinar Albrigtsen and Monika Nordli had a concert together with the choir "Salig Blanding" in the church in Borge (Lofoten Islands) in June 2014, and they ordered several music arrangements for mixed choir and solo singers, that Ken-G&slash;ran Mikkelsen wrote on request. - Wrote a special composition for the concecrations of the grand piano in the church in Stamsund, for piano and two trumpets (2013). - Arranged and wrote a full concert with Norwegian children songs, for mixed choir (2013). Read the review from the news paper (in Norwegian) here. - Arranged and wrote a full concert with songs by the Norwegian composer Trygve Hoff, for male choir (2013). - Wrote a music arrangement for mixed choir, which was used in the movie "Heart of lightness", that was released for the cinema in 2014. This music and his choir "Salig Blanding" participated in the movie. Read more about the here. - The church in Borge (Lofoten Islands) celebrated 25 year anniversary, so he wrote a compostion for organ to the celebration (2012). Read more (in Norwegian) here. - Borge Brass Band and the choir "Salig Blanding" had a Christmas concert together in the church in Borge (Lofoten Islands), and he wrote several music arrangements for brassband and choir. Especially the hymn "Mitt hjerte alltid vanker" was i big success, it was magic according to the audience (this was the encore...). Read the reviews from the newspapers (in Norwegian) here. - Arranged and adjusted a full concert and cinema exhibition with music from different movies, for band, mixed choir (2011). Read the review from the newspaper (in Norwegian) here. - For his own wedding, he composed a wedding march to his wife, "To Kristin", for organ and snare drum (2010). - Arranged two compositions for piano, brass ensemble and drum set for the concecration the brand new grand piano in the church in Borge (Lofoten Islands), in 2009. - Arranged and adjusted the "St. John passion" by J. S. Bach, for mixed choir, ensemble and organ (2009). - The church in Borge (Lofoten Islands) celebrated 20 year anniversary in 2008, so he wrote a composition for solo trumpet, brass ensemble, percussion and organ; "Ut mot Borge" (see video further down on this page). - On requests, he has composed and arranged several music works for brass bands, choirs, orchestra, ensembles, etc. F.ex. Borge Brass Band, Digermulen Brass Band, Salig Blanding, Manschoir Lofotr, and may others.